Over 110 people attended the Westwood Coalition’s June 12, 2014 community meeting. Some attendees left after the presentation portion and only fifteen people handed in comment sheets that night. However, more responses have come in via email and the website. An accompanying document provides more detail. A preliminary glance at the comments and the dots demonstrates that Option 1, No Build, is undesirable. Options 3 and 5 got high marks. Option 3 has a low number of negative votes*, as indicated by the 0-1 and 1-2 columns. Option 5 has more negative votes than Option 3 but not by many. Both Options 3 and 5 have comparable numbers of positive votes, as suggested by the 3-4 and 4-5 columns. While we will continue to assess this input, it seems to indicate the compelling vision expressed by these options and attendees’ interest in significant change in the business district. Note that Options 1 and 6 received twice as many negative votes as any other option (as defined by the two left hand columns, 0-1 and 1-2). Option 6 has 100 more votes than any other option, suggesting voting anomalies. The exceptionally high number of positive votes, completely out of line with the total possible votes that option could have received, supports this judgment even if exaggerated to some extent as others were. Voting irregularities, as witnessed by a number of people, included pooling stickers amongst attendees, putting multiple stickers in a section, and ignoring the criteria. Any reasonable person would point to this as a bold and crude attempt to sway the vote. Setting aside Option 6 for a moment, given the voting anomalies, and averaging Options 1-5, there was an average of 330 votes per board. Each person was given six dots per board (36 in all), suggesting that 55 people cast votes. We understand that this is not accurate but it provides a baseline. Now consider Option 6: 436 votes were cast, a 31% increase over the other options, suggesting that 72 people voted. There are 272 votes on Option 6 just for columns 0-4. Remaining consistent with the experience of the other boards (330 votes each), the column labeled 4-5 would have gotten only 58 votes, not the actual 164 dots. Suffice to say, the voting irregularities on Option 6 must be considered in context and with the narrative remarks that are submitted. Further, an analysis of all comments received to date demonstrates strong interest in Options 4, 3, and 5, in descending order, and limited support for Options 6, 1, and 2, in descending order, when considering respondents’ stated preferences in emails, on comment sheets, and via the website. What remains is very significant community interest in a Westwood Square and a dramatic change at that. The Coalition will need to review this report and the community comments before making a recommendation, but shortening the list to two or three options is fairly straightforward and the subject of discussion at an upcoming Coalition meeting. Please see the accompanying document for more detail. *“Votes” is used in this document to indicate meeting attendees’ assessment via dots on a criteria chart but should not be construed as a firm vote since the Coalition continues to receive comments and gather analysis. Also, “voting” irregularities skewed this process and, thus, it must be taken with a grain of salt. 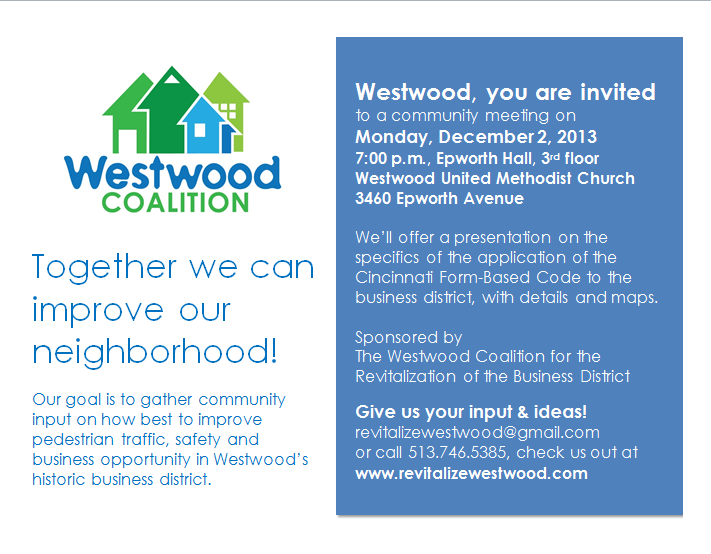 The Westwood Coalition welcomes the community to a meeting at Westwood United Methodist Church on December 2 at 7 p.m. We’ve talked about the Form Based Code before but this time, we’ll present refinements to the application of the Cincinnati Form Based Code to the historic business district. Wondering what that means? Well, back in August, about 80 of us came together to look at maps and talk about the area that might benefit from the Form Based Code. We said in our report and recommendations that we’d get back together as a community to share further developments to the map, or regulating plan, once City Planning officials refined it. Come to the meeting to see the details. Bring a neighbor with you. You might want to read our two page Form Based Code Myths and Realities in advance for a better sense of what the code is — and what it is not.